Artist's impression of the new walkway. There's a new bridge in town. 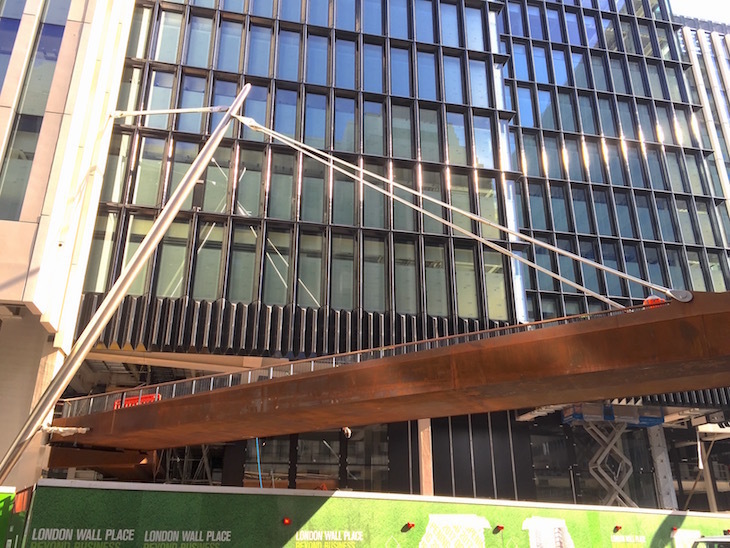 This corten steel walkway forms part of the huge London Wall Place development, to the north of the Square Mile. The new walkway has a surprising pedigree. It revives an idea from the mid-20th century, when the City of London got all gung-ho about pedestrian bridges. This was the planning concept known as the pedway. The pedway scheme sought to link together the buildings of the Square Mile at first floor level. You can still see remnants of the pedway here and there. 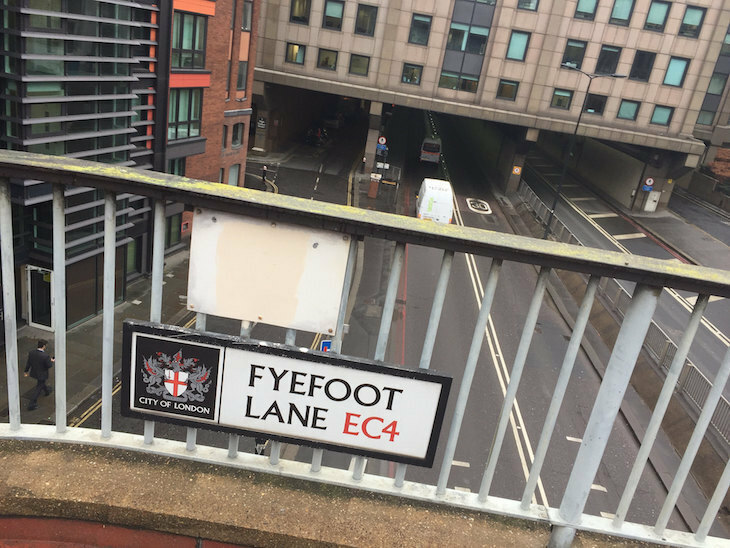 This bridge, for example, spans Wormwood Street, offering pedestrians a convenient way to get from the south side to a dead end of office windows on the north. Such bridges were once a common sight across the City. The scheme was borne from the devastation of the second world war. Heavy bombing had destroyed much of the City. But with destruction came hope. Planners had a rare opportunity to start afresh with the city’s fabric. The time was right to attempt a separation of pedestrians from traffic. The pedway scheme was born. This part of the pedway, over Upper Thames Street, is rare in having its own name, a revival of an old alley that was swept away during construction of Queen Victoria Street. Plans were first laid out by architects William Holford and Charles Holden in 1947. 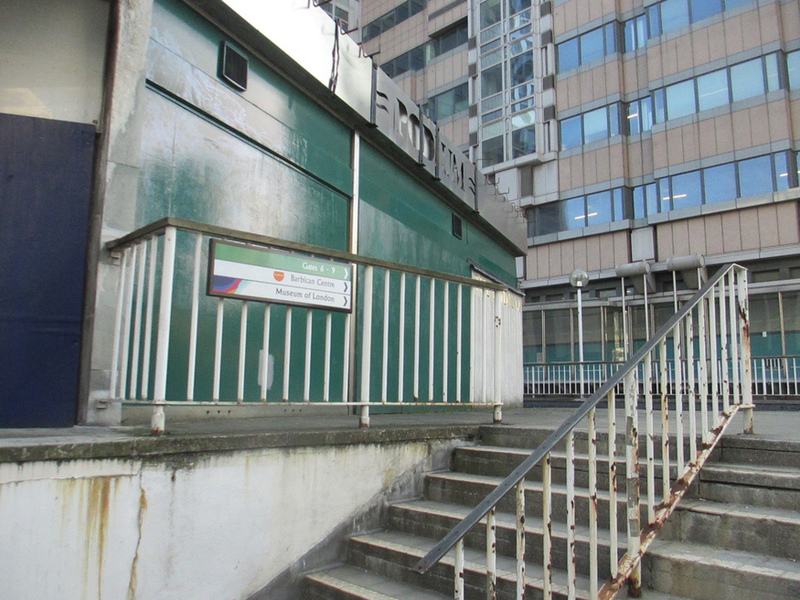 By the mid-1960s, the City of London Corporation insisted that any new buildings must incorporate first-floor access points to the growing pedway network. Sadly, the pedway scheme never really succeeded. The concrete bridges criss-crossing the City were underused. Some led nowhere — built as a condition of planning consent, but with no real purpose. Besides, people liked to be at street level, alongside the shops and cafes. The idea's only real crescendo was the Barbican Estate, laid out in the 1960s and 70s. This sprawling labyrinth of confusing walkways, blind corners and unexpected gardens was built above the most heavily bombed area of the City. 14 hectares of streets, houses, workshops and warehouses were replaced by a concrete micro-city open only to pedestrians. The Barbican's pedways did include the odd pub and shop. Most, like this one, have now been demolished. 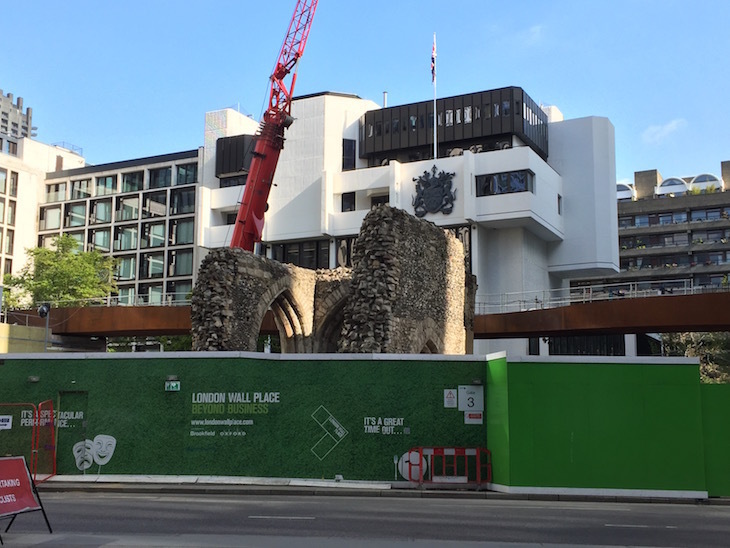 The Barbican complex remains largely intact, despite sizeable nibbles for Crossrail and the London Wall development. But the idea of linking up the wider City with overhead walkways stalled long ago. 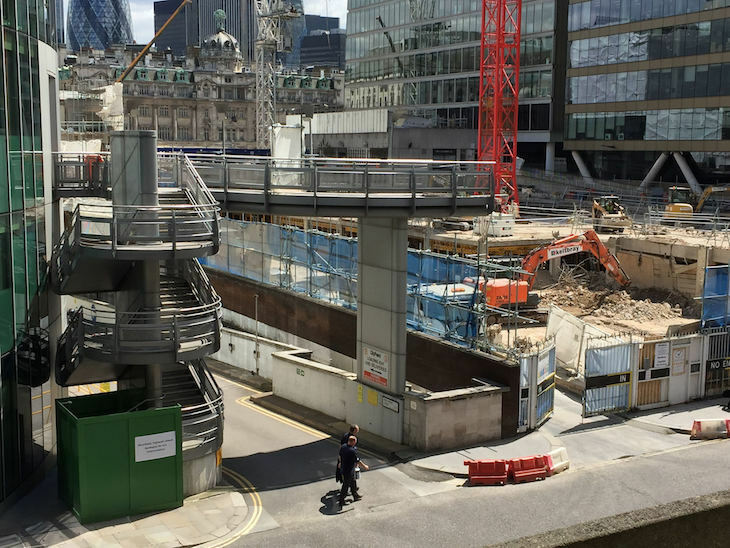 Many of the pedways elsewhere in the Square Mile have been demolished or fallen into disuse. Demolition for Crossrail has left this pedway stairwell looking like a high-diving board. The pedway scheme fizzled out in the 1980s. Its swansong might be considered the Broadgate estate, built at the end of that decade. This largely pedestrianised precinct includes a few raised walkways, though unconnected to the wider pedway scheme. 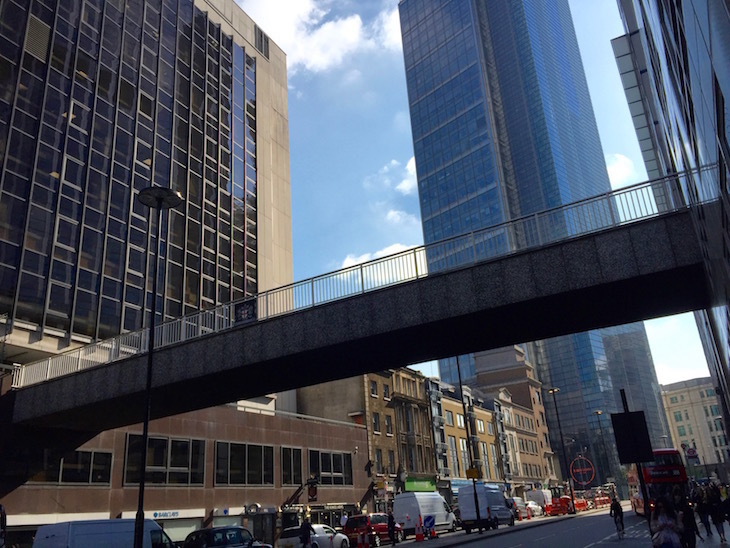 It looked like the concept was doomed to remain an historical curiosity, until the new development on London Wall revealed a new set of aerial walkways. The new walkway arcs round the remains of St Alphege church. These weathered-steel beauties are the first additions to the network in many years. True, they are a replacement for a demolished walkway rather than an entirely new piece of infrastructure. But their attractive, sinuous form is a far cry from the utilitarian concrete spans they replace. Perhaps these raised pavements will revive interest in the pedway scheme, and provoke other developments to contribute to a pedway 2.0. With modern habits turning us all into phone zombies, there's never been a greater need to keep pedestrians away from traffic. Learn more about London's pedway in this 2013 documentary.